The special election for the seat representing the 74th Assembly District is less than two weeks away, but one of the four candidates on the ballot is still hoping to get his name out there. That candidate is Juan Pagan, a resident of Jacob Riis Houses in the East Village, who is running against three others from his own neighborhood. Also running are Democrat and Working Families nominee Harvey Epstein, Republican Bryan Cooper and Green Party candidate Adrienne Craig-Williams. Pagan, 62, who worked in corrections at two points in the 1980s and 1990s, has run for office a handful of times before. Then, as well as now, he did it in part to protest “the machine,” or more specifically, the Democratic Party, which, he is arguing, chooses its favorites while edging out perceived interlopers. He first ran in 2006 against Brian Kavanagh for the Assembly seat he’s running for now, that Kavanagh ended up winning and holding onto easily for the next 11 years, before switching to the State Senate. Pagan ran again in 2010, 2012 and 2016. He also ran against then-Council Member Rosie Mendez in 2009 and for the seat again in 2017 once it opened up, though it was handily won by Carlina Rivera. Police are looking for an Alphabet City teen who’s been missing since Friday. 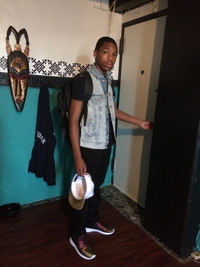 Fourteen-year-old Jamancey Vadon was last seen at home at Riis Houses building 90 Avenue D at around 11:30 p.m. He is described as being black, approximately 5’6″ tall, weighing 115 lbs. With a thin build and black hair. Anyone with information is asked to call Crime Stoppers at 1-800-577-TIPS (8477). The public can also submit tips by logging onto the Crime Stoppers website at nypdcrimestoppers.com or by texting tips to 274637 (CRIMES) then enter TIP577.